A prominence of bone on the top or the inside of the toe may cause pain and an inability to wear shoes comfortably. They are usually caused by an abnormal bone structure causing sharp or prominent bones. 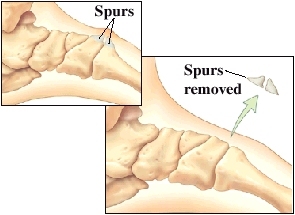 Fractures, injury or dislocation to the toe in the past may also cause bone spurs to develop. Hammertoes, curly toes or toes that are abnormally shaped that get pressure from closed shoes can also become painful. Tight shoes, especially heels and those that are narrow in the forefoot will aggravate the condition. Hard skin is usually seen on the top or the inside of the toe. A callus on the outside of the fifth toenail may be mistaken for an ingrown toenail. Redness or swelling around the toes is also seen and a prominent bone spur can be felt. In patients with poor sensation (diabetics), an ulceration of the skin over the spur may be seen. Wider shoe to lessen toe pressure is the primary treatment. Removal of hard skin to lessen the pain can also provide a lot of relief. Temporary padding of the toes may take stress off of the bone spur. Toe spacers made out of foam may also be used to prevent the bones from rubbing against each other. A Cortisone injection may also be needed to help to decrease inflammation and allow the foot to fit comfortably in a shoe. When unresponsive to conservative care, surgery to remove the spur or to correct the toe deformity may be necessary. This will not only help the foot become comfortable in a shoe but it will permanently correct the problem. Prominence of bone on the top or inside of the toes causing pain and an inability to wear shoes comfortably. Abnormal bone structure causing sharp or prominent bones. Friction of two bones against each other. Fracture, injury or dislocation to the toe causing a bone spur to develop. Hammertoes, curly toes or toes that are abnormally shaped. Tight shoes, especially heels and those that are narrow in the forefoot. Callus on the top or inside of the toe causing pain in closed shoes. Callus along the outer edge of the fifth toenail, mistakenly diagnosed for an ingrown nail. Redness and/or swelling around the toes. Prominent spur can be felt. Bursitis on the spur increasing pain. Possible ulceration of the skin over the spur caused from excessive pressure. Wider shoe to lessen toe pressure in the shoe. Removal of the hard skin to lessen the pain and pressure. Temporarily padding the toe to take all stress off of the bone spur. Applying a toe spacer (lamb's wool or foam) to prevent the bones from rubbing against each other. Cortisone injection to decrease inflammation. Surgery to remove the spur and permanently correct the problem is the treatment of choice if the condiion has been unresponsive to conservative care.